For eighth-grader Lakaysha Governor, her daily two-hour school bus commute had been spent catching up with friends and trying to tune out distractions from unruly preschoolers. Now, thanks to Google, the aspiring forensic anthropologist said she's able to spend that time finishing up her daily school work so she's free to engage in her favorite activity once she gets home: reading. 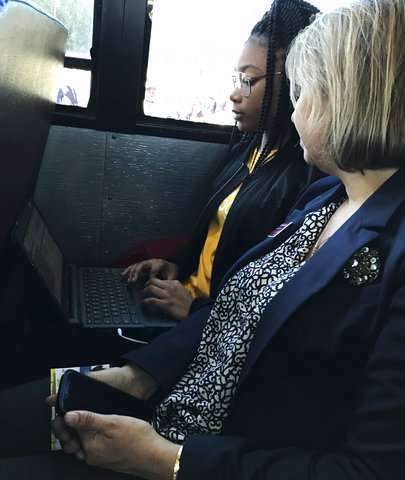 Lakaysha is one of nearly 2,000 students in South Carolina's rural Berkeley County benefiting from a grant from Google, which on Monday unveiled one of its 28 WiFi-equipped school buses in the area. The tech giant has also given the school district 1,700 Chromebooks, the stripped-down laptops on which public schoolchildren do their class and homework as school books largely are replaced by online worksheets and articles. Some students like Lakaysha in this sprawling, rural district about 50 miles north of Charleston spend a total of two hours riding the bus to and from school each day. With much of students' homework now online-only, that's time lost in terms of trying to prepare for the next day. The grant, Google's first of a kind in South Carolina, is no accident. Google has at least a decade-long relationship with Berkeley County, where it's invested more than $1 billion in data center complexes in Berkeley County since 2007, bringing more than 100 jobs. Google says it also has awarded nearly $2 billion in grants to local schools and nonprofits. Google hopes to expand the Wi-Fi program into other rural areas across the country, including other areas where it already has data centers, which process search queries and other information, according to Lilyn Hester, a Google spokeswoman based in Chapel Hill, North Carolina. The first such effort was launched last year in Caldwell County, North Carolina, where a data center already exists. The expansions are also needs-based, Hester said, and Google is focusing on rural places where broadband internet access has been slow to spread. "Why don't we make that instructional time?" Hester said of officials mused about the time many students spend on school buses. Google is already looking for ways to make the high-tech buses useful outside of school hours, working with the school district and community on places the buses can go once the school day is done to bring connectivity elsewhere, such as a community center or fellowship hall. Lakaysha, the eight-grader who has her eye on Harvard, has internet access at home like most of her friends. But thanks to the WiFi buses, she can get ahead on her work. Teachers are happy, she said, because "more students are doing their homework." And those rambunctious preschoolers are even quieter in the mornings, too. "Now that we have the Chromebooks and the WiFi, they're kind of quiet; so it's good for everybody."